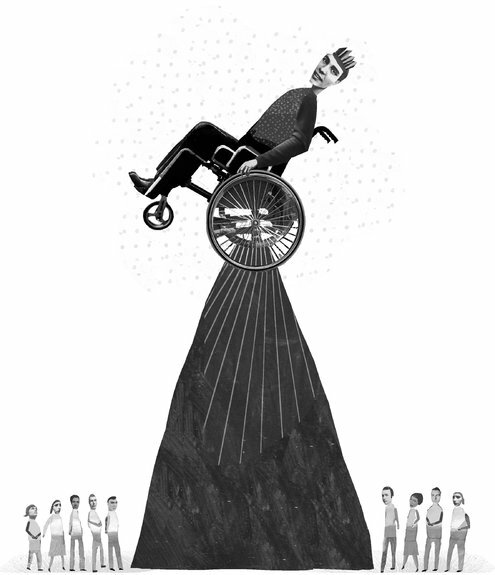 My Facebook friend, Ben Mattlin, has a gently humorous, and yet serious, take on life in a wheelchair running in the New York Times. Although he makes a larger point, he alludes to something I've tried to employ since I smartened up -- humor attracts more bees than anger and self-pity and a sense of entitlement. Humor also ameliorates the unwanted attention sometimes focused on people with visible disabilities. Back when I had hair, I would always ask for a discount when going to a new barbershop, insisting I deserved it because I had brought my own chair. LOS ANGELES — LAST week, the celebrity gossip site TMZ posted pictures of Justin Bieber in a wheelchair. He was not at a hospital. He was at Disneyland. As everyone knows, Disney patrons in wheelchairs get to cut to the front of the lines. But as a dispute flared over whether this was Mr. Bieber’s intent, becoming a trending topic on Twitter, one fact remained unassailable: I was there first.